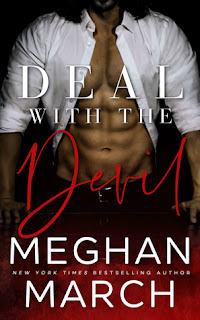 Meghan is the master of starting a series with a bang that continues all the way though to the last page. Deal with the Devil is no different, the more you read, the more you are consumed with Jericho Forge. Deal with The Devil was everything I hoped for and more. It is suspense filled, has an arrogant, dirty talking alpha male shrouded in mystery and a feisty heroine down on her luck who is willing to risk it all with an ending that will leave you begging for the next book.